Worried about all the chemical nasties that come in commercial soap and what they might be doing to your skin? With a Heyland & Whittle voucher you can make great savings on 100% natural skincare products made in the UK. 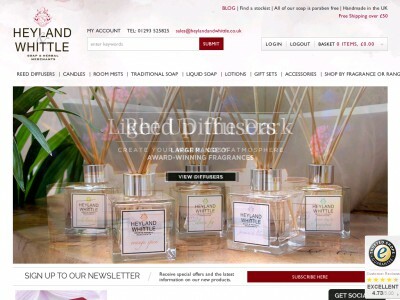 From softening solid and liquid soaps made with floral essential oils to room mists and reed diffusers that will fill your home with a beautiful aroma, Heyland & Whittle voucher codes will save you money while you shop. Founded in 2003 by husband and wife team Paddy Heyland and Ursula Whittle, Heyland & Whittle is dedicated to providing high quality, natural soaps and fragrances for the discerning customer. Originally established on the family's rural farm in Surrey, England, the company uses traditional methods such as cold pressing to create handmade soaps from the very best ingredients. Over the years the company has expanded their range to offer scented candles, diffusers, rooms mists, lotions and more as well as their natural solid and liquid soaps. Using essential oils, herbs and spices they create beautifully scented products that will make your skin and your home smell divine. Most modern soaps contain parabens, which are used to prevent the spread of bacteria but can be harmfully absorbed through the skin. They are also thought by many to have a negative impact on the environment. Heyland & Whittle's soaps and other products are completely free from parabens, making them a great choice for anyone wanting to live a healthier, more natural lifestyle. They're also made without the use of the chemical detergents found in commercial shampoos, such as sulphates, so they're kind and gentle on your skin – ideal for anyone with dry or problem skin. Heyland & Whittle pride themselves on their natural, handmade products and traditional approach. Their soaps are available in both liquid and solid varieties, combining plant oils and botanical extracts to create moisturising soaps that work up a good lather. Available in a choice of fragrances such as rose, lavender and mint – as well as more adventurous combinations like 'Queen of the Nile' and 'Summer Solstice' – the soaps come in a small size or as a large brick that will last for months. The company also offers a range of hand and body lotions, scented candles and room fragrances, gift sets and accessories – everything you need to naturally enjoy beautiful fragrances in every aspect of your life. Want to get shopping with Heyland & Whittle? With a Heyland & Whittle voucher you can enjoy fantastic savings while you shop. Whether you want an indulgent soap scrub for soft and slowing skin or a reed diffuser to fill your home with a delightful fragrance, Heyland & Whittle vouchers will help you indulge yourself for less. Browse our website until you find a Heyland & Whittle voucher that suits you, then navigate to their website to begin shopping. Enter your Heyland & Whittle discount code in the box provided and click 'Apply'. If you've enjoyed shopping for beautiful, natural products with Heyland & Whittle, you might like browse our great deals on beauty products at AllBeauty or The Body Shop. Or, if those aren't right for you, you'll find plenty more stores in our Beauty and Health section. Amazon UK offers no voucher codes? Not to worry, in the category Home & Garden you will find a lot of nice coupons and voucher codes for stores such as John Lewis, Marks & Spencer . Enter your Heyland & Whittle discount codes in the box provided and click 'Apply'. Enter your personal and payment information to complete your order. Shipping is dependent on the size and weight of your order. Free standard UK delivery is available on all orders over £50. If you need to return a product for any reason to Heyland & Whittle, you can take advantage of their 7 day 'cooling off' period and cancel your order within 7 days of receipt. Items must be returned within 21 days for a full refund. Need to contact the team at Heyland & Whittle? Whether you have a question about your order, want to know more about what goes into their natural soaps and fragrances or simply want to find out how you could make big savings with Heyland & Whittle voucher codes, you can contact the Customer Services department by telephoning 01293 525825. Want to find out more about the beautiful, natural products on offer at Heyland & Whittle? The company maintains a profile across all your favourite social media networks. Follow them for lots of exclusive content including competitions, special offers, pampering tips and much more. You can also use these pages to find out more about saving money with Heyland & Whittle vouchers. Don’t forget to check them often, as you can never be sure when a free Heyland & Whittle discount code might be waiting for you! Buy now online at www.heylandandwhittle.co.uk.